I have lived in Argentina my whole life. My bank accounts have been frozen and once I lost almost all of my savings without warning. I’ve done things like travel to Uruguay for the day to get US Dollars from the ATMs. I, like many Argentines, store money under a mattress. I, like many Argentines, bought my home in US Dollars, in cash. I, like many Argentines, lack confidence in the peso. I, like many Argentines, do not trust our national financial system. Argentines like myself are “economic jugglers”, always finding a way to make do within the constraints of instability. That is why I am proud to be working on Celo to test stable value digital currencies in Argentina — for myself, for my community members, and for my country’s future. As Project Manager and Celo’s first contributor in Argentina, I am responsible for all logistics and management of the pilot. I am also the person that is closest to our users. I hear from them every day and I can see how Celo could help solve some important problems in our country. Like many Argentines, our users want a secure and accessible way to save and send value. Celo’s early pilot results show that, and I’m excited to share some preliminary learnings from our work over the last five months. Hyperinflation: since the beginning of 2018, the peso has decreased ~60% in value. General distrust of the banking system: starting with Independence in 1818, Argentina has defaulted on foreign debt 8 times. In my lifetime, I’ve lived through 4 major financial crises. High Android/smartphone penetration and internet connectivity: 71% of adults use the internet (source: World Bank), 92% of adults will be mobile users by 2020, 71% smartphone, and 94% of smartphone users have Androids (source: GSMA). Do users ascribe value to currency & use the Wallet as store of value? Do users use the Wallet to send & receive payments? For the test, each verified user received a credit of 50 Celo Dollars, which could be used for peer-to-peer payments and to purchase products at accepting merchants. We felt 500 verified users was a good stretch goal and enough of a critical mass for better understanding specific usage patterns. Secure at least one merchant and / or cash in/out point in each community so participants have the option to spend. Learn about the particularities of the Argentine market through interviews with users, potential users, and businesses. When deciding which communities to work with, we were looking for potential participant density and a degree of social connectedness, as well as a less vulnerable population since this was our first time in market. For business participants, the primary criteria was proximity to users (in the case of universities, cafeterias located in their facilities and, in the case of closed neighborhoods, neighbors offering products and services within the community). For interviews with users and businesses, we identified different profiles, from professional or crypto people to individuals from humble areas with lower levels of financial management. We hosted a series of events, talks, and other in-person initiatives to engage with the community. 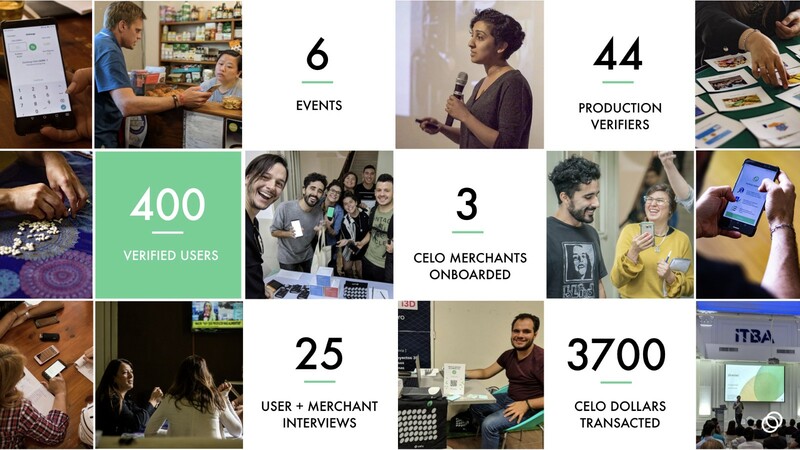 To date, we have over 400 verified users who have transacted almost 4,000 Celo Dollars for peer-to-peer payments and small purchases at dedicated merchants. We’re still running the test and are continuing to track usage and record our learnings. Between our design research and product tests, we’ve gathered dozens of insights. Here are a few of the highlights. During this test, we learned a lot about general usability as well as the specifics of operating in the Argentine market. An example is variability across mobile carriers. In December, we discovered that the text messages we used for invites were not accepted universally by the most popular mobile carriers. As a result, we were able to address this and make improvements to the invite process so that users could be added across all mobile providers. “Investing” is seen as wealth preservation and done in the form of: buying goods, property, or USD. Finance and investing feel overwhelming to the majority because there is no formal education in it. Interestingly, because there are classes in accounting in school, people maintain a budget and are good at record keeping (regardless of level of education). One-third of workers in Argentina are not registered with the authorities, a figure that has remained consistent for decades. Informal workers don’t have access to health coverage, pensions, or retirement plans. A potential barrier for mass adoption is bringing informal workers into the system (and thus subject to taxation). A new class of informal workers is emerging with people earning and investing in crypto. ATMs frequently run out of cash, especially after pay days and when rent is due. In running this test, we are thankful to have had the opportunity to meet and learn from so many users of the Celo Wallet. We are excited and impressed by many students’ and community members’ enthusiasm towards blockchain and its benefits. We talked to users who loved the technology but were scared off by price volatility; others found censorship-resistance and self-custody interesting but found human-unreadable wallet addresses cumbersome. Our biggest takeaway here — people are excited about crypto and it’s our job to make it easier to adopt and use. This test has given us some great feedback that will inform the work we do on the Wallet application in the coming months. We will continue learning, iterating, and sharing along the way. Photo of Hugo, who we met in Luján, Argentina.